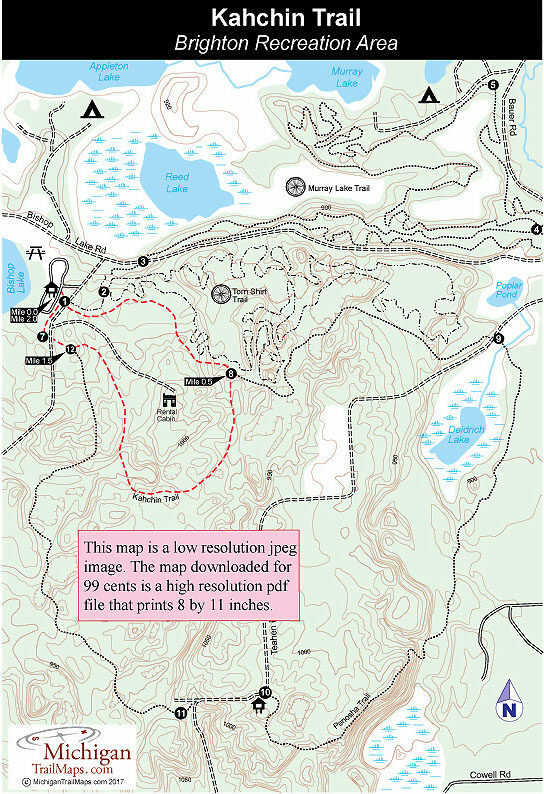 This trail is listed as a 2-mile loop but is actually closer to 1.7 miles from start to finish at the trailhead in the Bishop Lake day-use area. If you need a little more mileage on your hike, it’s easy to add this loop with the Penosha Trail for a 6.2 outing. You begin on the Penosha Trail for the first half mile but then depart it at post No. 8. For the most part the next mile is a walk in the woods with few significant features. The best section is reached within a half mile of post No. 8 where you are treading along the crest of a rolling ridge with a dry kettle to the right of you and a marshy one to the left. The trail then descends before making its longest climb. You return to the Penosha Trail at post No. 12, 1.5 miles into the walk and less than a quarter mile from the trailhead. Brighton Recreation Area maintains a day-use area on the east half of Bishop Lake and includes a sandy beach, picnic area, and bathhouse. There is also a boat rental concession that rents canoes, rowboats and paddleboats daily from throughout the summer. There is a day-use area on Chilson Pond with a smaller beach, picnic tables, grills and three shelters. On the shores of the largest lake in the park is Bishop Lake Campground, which contains 144 modern sites in a mostly open area of young trees. None of the sites are on the water, and there is very little shade. The campground has its own beach, and the boat launch for Bishop Lake is located here. More wooded settings are found at two rustic campgrounds, each with 25 sites. Appleton Lake Campground is posted on Bishop Lake Road and features picnic tables, fire rings and access to the water. Murray Lake Campground is off Bauer Road. A organization camp is located on the south side of Bishop Lake. The park has five rustic cabins built and design for family use. Two of the 8-bunk cabins are located near Caroga Lake while another is only a short walk from the south shore of Bishop Lake. Each cabin has a hand pump and a vault toilet as well as a fire ring a picnic table outside. From I-96, just west of US-23, depart at exit 145 and head south on Grand River Road and then turn west onto Main Street in downtown Brighton. Head west for 6 miles as Main Street becomes Brighton Road and then turn south onto Chilson Road to reach the park headquarters in 1.5 miles. Across from the headquarters is Bishop Lake Road which heads east a mile to the main trailhead at Bishop Lake day-use area. The park headquarters (810-229-6566) is 1.5 miles south on Chilson on the west side of the road. 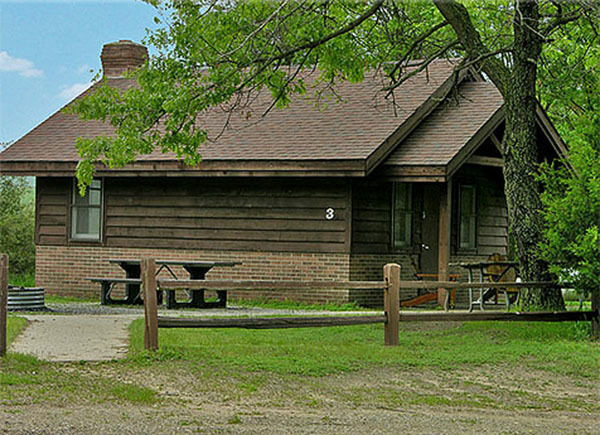 For a campsite or cabin reservation contact Michigan State Park Central Reservations (800-447-2757; www.midnrreservations.com).